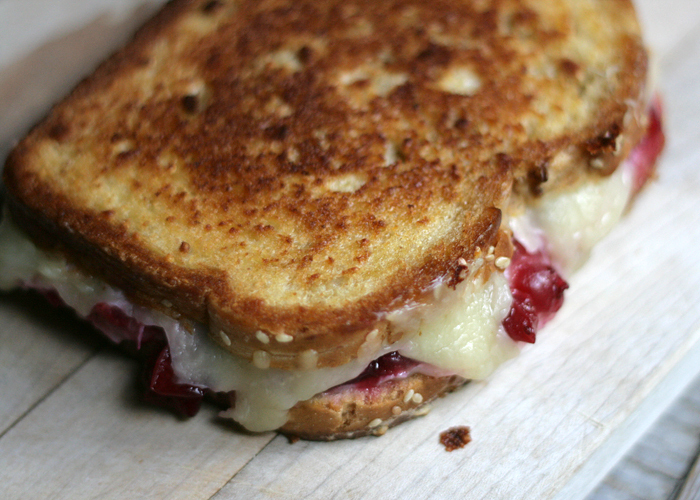 Cranberry White Cheddar Brie Grilled Cheese Sandwich recipe first. Personal notes and shopping resources follow. Spread about ½ tablespoon of butter onto both sides of each slice of bread. Heat 1 tablespoon of grapeseed oil in a frying pan over medium-low heat. Place both slices of bread in pan and lightly fry. Turn both slices over in the pan. On one slice, pile the shredded Cheddar (melty) cheese. 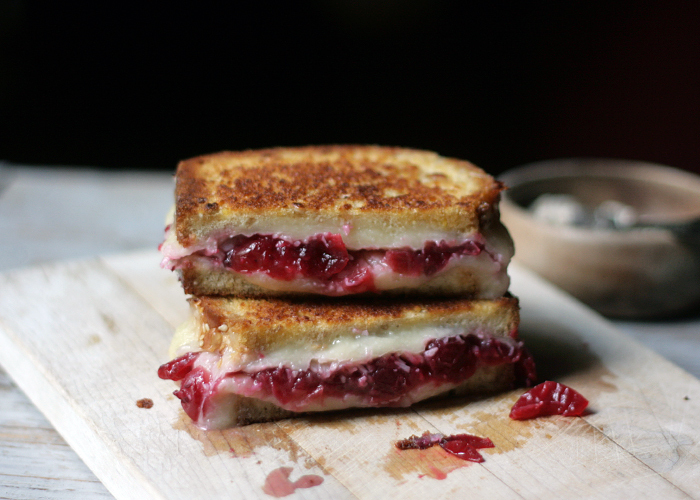 Drop spoonfuls of cranberry sauce over the cheese, add any optinal extras if you’re using, then carefully lay slices of Brie (soft) cheese on top. “Cover” with the other slice of bread, toasted side to the inside. Press down on the sandwich and fry until golden, about 3 minutes. With a flat spatula, lift the sandwich out of the pan and add more oil if needed. Carefully turn the sandwich over in the pan and fry the second side until dark golden brown. 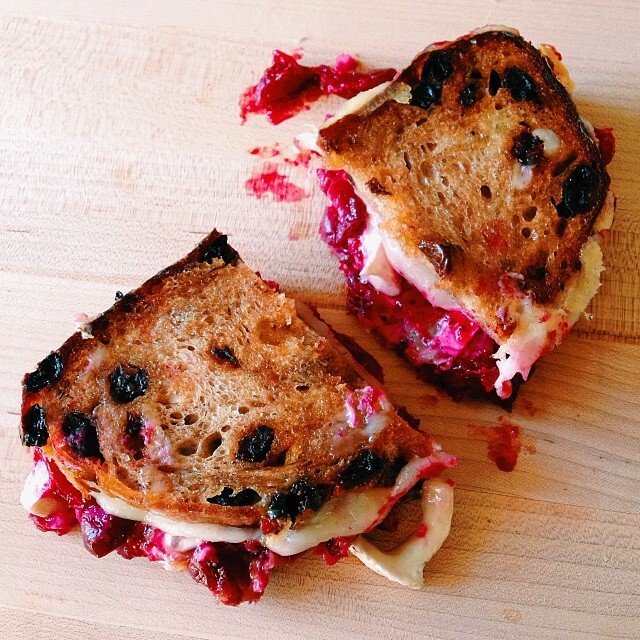 Remove sandwich from pan, cut in half, and eat immediately. I use whatever bread is available/leftover/in the freezer, and have even made this Grilled Cheese sandwich with a raisin-studded cinnamon swirl bread (see photo below), which is shocking because dried fruit (and nuts) should NEVER appear in bread. 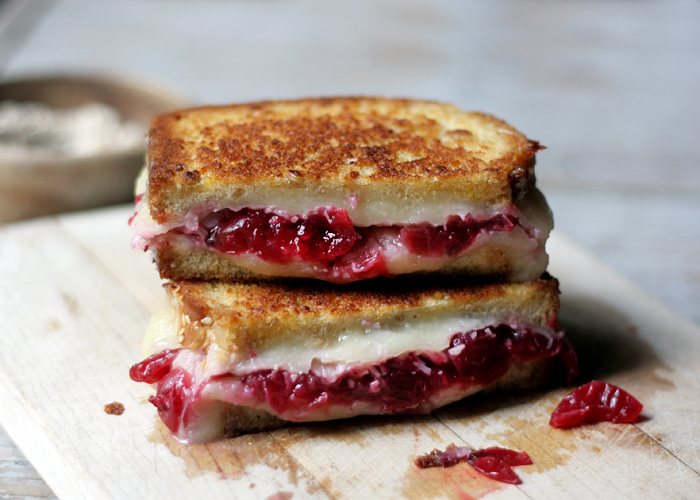 This coming fro someone who eat cranberry sauce with cheddar cheese. This is the very simple classic cranberry sauce we have every year at Thanksgiving. 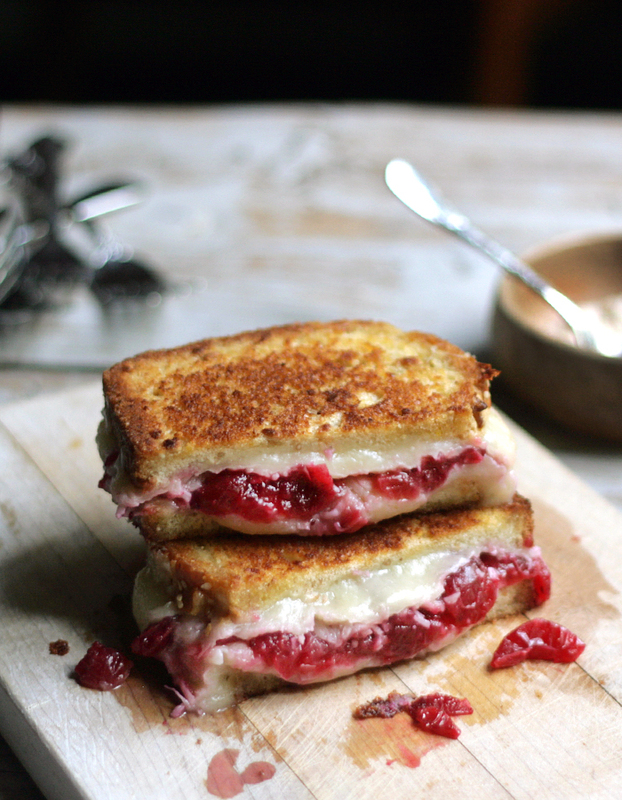 Adding something spicy to this grilled cheese helps round out the other sweet, sour, and creamy tastes already in the sandwich from the cranberries and cheese. I wouldn’t go out and buy them just for a grilled cheese sandwich that’s meant to use up leftovers, but I like fresh wild arugula, which is a “spicy” green, or fresh sliced jalapeños. A long time ago, I dated a sweet, reliable accountant from Wisconsin who told me that cranberries in cheddar cheese made it fancy and special and I was like “what NO you do not put fruit in cheese omg we have nothing in common you are a Midwest cheddar guy and I’m a sophisticated Brie girl” and then we broke up and now he’s rich and married to a hot, young wife and has two kids. And I’m in my kitchen making Cranberry, White Cheddar, Brie Grilled Cheese sandwiches, belting out Ariana’s “thank u, next” with my two backup chihuahua dancers.